With the support of many people, I've been fortunate to build houses all over the world. How exciting to be able to help people in my home state of Indiana attain the American dream. We call it the theology of the hammer, putting our faith into action to provide all people a decent place to live. 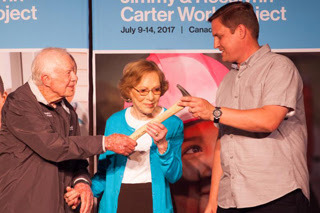 I am planning to join President and Mrs. Carter and about 2,000 other volunteers from around the world to build homes and change lives in Mishawaka, Indiana through the 2018 Jimmy & Rosalynn Carter Work Project. Our goal is to build or repair 38 homes in the Mishawaka/South Bend, Indiana area in one week - August 26 to August 31, 2018. I wish the simple act of volunteering my time and effort was all that was required; however, there is also a cost involved. My goal is to raise $2,000. 100% of these funds will go directly to helping me get to and back home from the building site in Indianal; to purchase the needed building supplies to aid in the construction of the homes and to provide basic food and shelter while I am there. Every penny of your contribution will be accounted for. History has proven that people of all nations who have a home to live in, have something to live for. Their gratitude is overwhelming and indescribable! I have seen it so many times in North Texas. This is the main reason I have donated almost every Saturday, for many years to helping Habitat for Humanity. I am grateful for whatever you can donate to help me to help all of us in this wonderful land of opportunity and abundance to spread our love.